Use these tips to prepare yourself and your home for holiday guests. When you’re hosting houseguests for the holidays, the first instinct is to make every nook and cranny of your home look as pretty as possible. 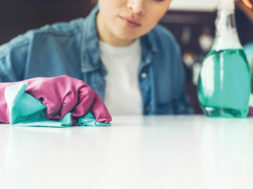 However, Jenny Killingsworth of Ruby Red Cleaning says you don’t need to stress too much about your guests noticing the things that you’re worried about because most homes look spotless even when they’re not. If you have plenty of time to clean, take the opportunity to reach high and low. Dust fans and light fixtures, wipe down blinds and windowsills, clean the baseboards and doors, and vacuum underneath the beds. When you’re having a hard time finding the time, focus on what matters most. Killingsworth suggests hand-dusting with a cloth and spray in the guest bedroom and bathroom as well as vacuuming and mopping the floors, putting fresh sheets on the bed and placing towels at the end of the bed. In the common living areas, do a quick dusting of surfaces, focusing on areas used most often and areas at eye level. Also, fluff and straighten the couch pillows and put out holiday greenery. “It’s the small touches that make the biggest impression,” she says. If you have no time at all, focus on de-cluttering common areas, changing the sheets in the guest bedroom, fluffing pillows and lighting a scented candle. 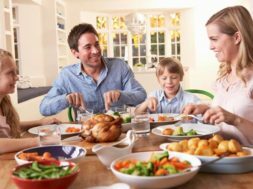 Keep your home guest-ready all season long with the following tips from Killingsworth so you can confidently open your door at a moment’s notice. 1. Keep extra towels and linens on hand. 2. Prepare ideas for connecting like board games, holiday crafts and baking. 3. Do a quick sweep or run a dust mop along the floors each evening. 4. Have a quality feather duster on hand for quick dusting options. 5. Get going a little earlier to tidy up first thing in the morning just in case guests stop by unexpectedly. 6. Keep extra sponges or cleaning cloths on hand to keep things wiped down at night. 7. Keep store-bought refrigerated cookie dough on hand so you’re ready to offer a sweet treat. During the holiday season, it’s all about connecting with your guests throughout their stay.